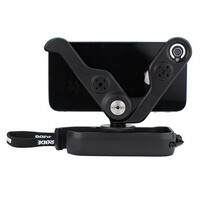 The RodeGrip is a multi-purpose mounting solution for the Apple iPhone 5C. Featuring a camera-shoe mount with a 3/8″ thread in the base that can be mounted in three different positions the RodeGrip can be used in a number of orientations and setups. This entry was posted in Rode and tagged PA-DJ-and-Lighting. Bookmark the permalink.